I wrote this introduction to Boscombe Down due to various emails sent to me regarding 'watching operations' at the base during active hours. Boscombe Down is located just south of the town of Amesbury in the county of Wiltshire. To get to the area you follow the major road A303 until you get to the junction for Amesbury, not far east of Stonehenge. The location of Boscombe Down is very easy to get to. It resides next to the very busy A303 and so general operations at day time can be viewed from driving along here however you cannot stop on the road to watch, find a service station (just north of the base) to sit and watch for a distant view. Aircraft may fly unlit with aerodrome and obstruction lighting extinguished during flying. Boscombe Down is the Ministry of Defense (MoD) facility for developing, testing and evaluation of all aircraft, weapons and avionics that will enter the British armed forces. It is the British answer to the AFFTC at Edwards AFB and they have affiliation with each other on certain programs with personnel from the UK based at Edwards and Plant 42 and with BAe Systems/DERA operating from Mojave Airport and China Lake. It was recently privatized and changed holders from MoD DERA (Defense Evaluation Research Agency) to the civilian name of QinetiQ (Kinetic). However DERA still have overall control of Defense evaluation and testing of all things 'military'. On a day to day basis you will have various aircraft on trial here, mainly aircraft that are already in service or are in imminent service. These aircraft as you might expect can be viewed elsewhere in the U.K but the particular residents of the 'Down' have much more trial equipment. For example, the Tornado GR4 was developed here recently and so the new features of the Tornado GR4 are also tested here, such as the SAR and TIALD systems plus the weapons it will be cleared to carry in the future. Many foreign aircraft are often seen here on operations with the based units and many of these include European and United States aircraft. The United States send over their Test Pilots to Boscombe Down because Boscombe Down has a world renowned number one Test Pilots School and so like the USA, European and Australian pilots also come here to learn how to become a fully fledged Test Pilot. They then go back to their resident units in their home country to become test pilots on their own aircraft. Regular slots each year are filled up by USN Patuxent River pilots who come here to learn the advanced stages of becoming a Test Pilot. Once a year they bring over their NP-3D Orion and conduct joint trials and training with Boscombe based units and RAF active duty units such as Nimrods. The callsign for this particular Orion is TESTER 443. Future European and US fast jet test pilots also come here, and it is very common to hear US pilots flying the British aircraft on major trials, infact almost daily. For this stage of training they enter the world renowned 'Empire Test Pilots School' and conduct joint trials with various 'Empire' nations of the commonwealth as well. We have looked through what DERA does. They conduct the trials for aircraft, weapons and avionics. The SAOEU are the main players in evaluating current and future weapon systems for aircraft. They conduct all known weapons trials and the avionics that go with them. They have a permanent complex at NAWC China Lake in California of which the MoD actually owns, in a small area of that extremely large weapons range. The part they own is named the 'ALARM building' and got its name from the testing they conducted with the very advanced ALARM Anti-Radar missile. Today they have very long detachments at China Lake using the front line aircraft of the RAF. These are the Tornado, Jaguar and Harrier GR7. They conduct weapons trials with various units, and in 2002 they are undergoing Storm Shadow Cruise Missile testing for the RAF and Brimstone Testing, a new anti-armor missile based on the Hellfire but for fast jet use instead of helicopters. They also conduct laser guided bomb tests, cluster bomb tests and the like here. You will find the SAOEU flying all over the UK on a daily basis testing new systems and it is common in my area for them to be at very low level. (I happen to live in the primary Boscombe trial area). Major allied forces also conduct training with this unit, and it is not uncommon to hear US pilots flying these aircraft. The Aviation School of Medicine uses a few Hawk Jet aircraft for development of G-Suits, Black-Outs, Red-Outs, G-LOC, and anything that effects a pilot in flight whether it be life threatening or not. It is a vital part of development for fast jet pilots. One of their Hawks is called 'ASTRA'! Nearly all aircraft in British inventory status are based here at Boscombe Down. On occasion the Eurofighter Typhoon can be seen here from its home at BAe Warton a long with Canberras from MoD Llanbedr. Various other aircraft may visit for trials including all RAF, RN and Army types. Getting closer the base makes it more difficult for you, depending on the generosity of the MoD Police. There are several viewing locations around the perimeter however if you are spotted with any sort of Camera equipment or for that matter, any kind of optics whether it be Binoculars or Cameras then you will be intercepted within minutes by the MoD Police. Some people have got away with this (me included) and have never been approached, however many people have been approached by the guards within just a few minutes of getting their camera and binoculars out. My last visit to Boscombe was when i was enroute to RAF Fairford to watch the B-52s take off to Iraq. I was able to snap various photographs of aircraft landing at the base with no opposition from the MoD police, they just sat there like the cammo-dudes do and watched me throughout, some driving by and asking if i was okay. If you don't do anything silly, like go right up to the fence and touch it etc then you should be okay. There are various places to watch the operations but these just draw attention to yourself so you have to very careful, and the security has gone balmy since September 11th. There are small roads just under the approach here so it is easy to get very good photographs of the resident and foreign aircraft landing. Depending on the wind, go to the other end of the runway, however like mentioned, be careful. The Security all around the base is extremely tight. And to gather more information about you 'snooping' they have a series of CCTV Cameras dotted around the base perimeter fence to keep and eye on literally everything moving around the fence. You'll come across the usual signs attached to the fence, like you do at many other airfields in the UK which generally say the same things than that of the signs at the Groom entrance. Such as "No Photography is permitted" and "MoD Installation, trespassers will be prosecuted, no photography allowed" etc etc, which is just the normal. Image: Copyright©2003. Richard Cliff. All Rights Reserved. Note the signs. The one on the left says "Notice: Prohibited Place under the Official Secrets Act. Any unauthorised persons found on these premises will be prosecuted" and the one on the right says "Use of Video Cameras and Photography is not permitted". Once the aircraft land here, they go out of sight due to the elevation of the airfield above the viewing points. This is a photo of an Empire Test Pilots School Jaguar GR1 attack aircraft on a very murky/hazy day. If you are on the eastern side of the base, then you will see the many Hardened Aircraft Shelters (HAS) that are dotted around that area. These are normal shelters for RAF airfields, something you will never see in the United States but are extremely common here in the UK and Europe where we would of bore the brunt of any Soviet air attack. These shelters house various equipment along with the odd aircraft but at this particular airfield they are not in use as much as they would be at any other major active airfield. One area of the HAS complex is actually the Boscombe Down museum, but it is not often you are allowed to see what goes on here either! At active duty RAF airfields such as RAF Marham, a Tornado GR4 base, the HAS will have a one or two Tornados in each plus all the equipment to get them running short notice, and living quarters for the crew and support personnel. They are fully independent hangers. Again you are faced with a 'severe' watch of guards when you are here, like anywhere around the perimeter DO NOT take photographs, you are seriously putting yourself at risk. You may be able to get away with it, but that will be your choice. I have lots of times! I could go on about other viewing points, but half the time you get here you are wasting your time (if you stop and get out), with a 90% possibility you will be approached by the MoD and moved on. You can circle the base endless but if you stop and try to view operations then you will be keep being moved away. If you disobey these orders and come back once the MoD have disappeared then they too will come back but with an 'enhanced-change-of-mood' so it is best not to push your luck. If you do stop, just be friendly, answer questions truthfully and state that you are just following your hobby of watching military aircraft and taking photographs for your own personal use. It is easy to take photographs of the based aircraft on approach and taking off, but you just have to watch yourself, which is the same for most bases nowadays. The MoD are very much more 'gruntled' here than any other installation with base aircraft in the U.K. Just be careful and obey the rules. 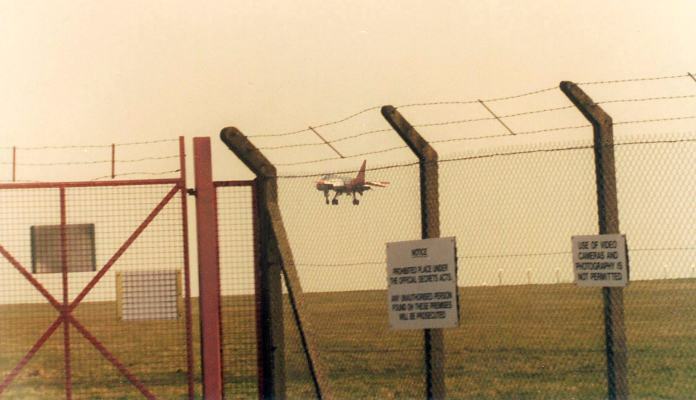 At a lot of airfields in the UK you can sit next to the fence and signs and take photographs with no harassment. I have actually sat with RAF Police Dog Handlers at RAF Marham, with them listening to my Scanner during their Dinner break, and they were very relaxed after asking me some vital questions. From then on, it was a regular occurrence for those particular police officers to sit with me (albeit I am on my side of the fence, and they are on the other) and chat, listening to the scanner. We even got a few 'displays' by the resident Canberra PR-9 Spy Planes that came home for approach with the Police Officers hearing the Canberra pilot on the Tower freq. saying they would do it for us... Something you hardly ever see or hear, and since September 11th, something you would be nuts to try and do now, but I lived near the base and so I was a regular face. Don't forget, you ARE BEING WATCHED by Cameras as well as Security Police and they have 'much more powers' than the Camo-Dudes you see at Groom Lake! So you have been warned. Near by Boscombe Down are two major MoD and Army Installations and these are very strict on security also and also some major range facilities. Just south of the 'Down' is the MoD's Nuclear, Biological and Chemical Warfare research establishment called 'Porton Down' and this is extremely security conscious as you would expect. They develop various toxins, chemicals and biohazards here as well as test them. Most of the British Chemical and Biological weapons programs have been developed here. The best thing to do is to just not go near this establishment and leave it alone. Since September 11th you can guess why I said that. To the east of the base by a few miles is the main British Army Air Corps Airfield. AAC Middle Wallop is home to the British Army WAH-64 Longbow Apache fleet, Lynx Attack fleet, Gazelles and Squirrels. Again the base, since the introduction of the Longbow has increased its security considerably. To the north of the A303 is the British Army's main Battlefield training range. It is a live weapons range for Artillery, Rockets, Hellfires, Machine Guns and major Tank training is conducted here also. Larkhill Range is a live artillery range and also has live Helicopter weapons firing. Simulated NBC attacks are also conducted here, with Boscombe Down based jets 'spraying' the army with colored water simulating a chemical and bio-attack. Major helicopter operations take place here with Chinooks, Merlins, Pumas, Gazelles, Apaches, Sea Kings a long with a very large FIBUA town specially developed for fighting in built up areas. So, the overall security of this particular area of England is 'the highest' state, so just be careful.